These delicious brownies with cream cheese combine the flavors of two popular desserts. 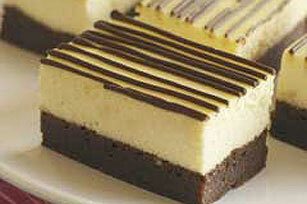 A moist cake-like brownie topped with a creamy cheesecake filling, it is sure to please your family and friends. Starting with a cake mix, this brownie receipe is quick and easy to mix. Having all the ingredients at room temperature will make them even easier to blend. To make this an elegant looking dessert, drizzle chocolate syrup on the brownies before serving. 1. Preheat oven to 325 degrees F. Lightly grease a 13 x 9-inch baking pan. 2. In a small microwave-safe bowl or measuring cup, microwave the butter until melted. 3. In a medium bowl, add cake mix, butter and 1 egg. Stir until just blended. Batter will be thick. Pour batter into baking pan and spread out evenly. 4. In a small bowl, mix powdered sugar, cream cheese and 1 egg together. Spoon this mixture onto top of batter, spreading evenly. 5. Bake for 20 to 25 minutes. Remove from oven and let brownies cool in the pan. Before serving, drizzle chocolate syrup over the brownies. Cut into squares or bars and enjoy.